Some of the alerts you might see in the Facebook app. 30 million accounts on Facebook were recently hacked with attackers gaining access to highly sensitive personal information. The FBI is investigating the hacking an has asked the company not to reveal who was behind it. Facebook originally disclosed the hack to the public two weeks ago saying 50 million accounts were compromised. 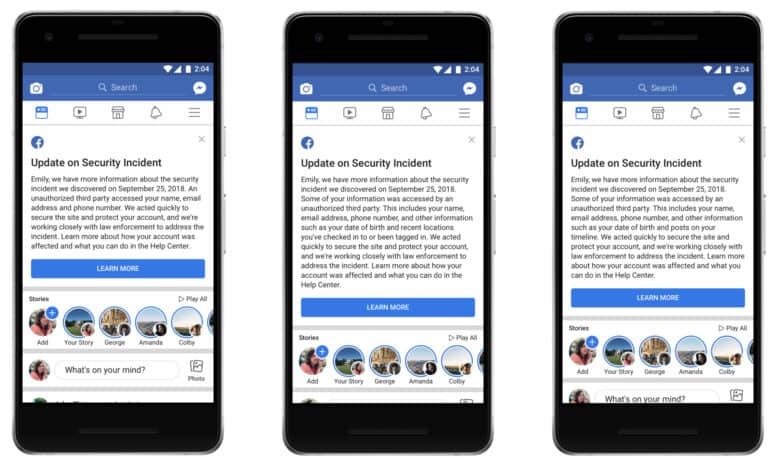 That number has now been reduced to just 30 million, but the amount of data stolen makes it the worst attack in Facebook’s history. For Facebook users that are concerned that their data isn’t safe, there’s a way to tell if it was stolen in the massive hack. All you have to do is visit this security notice page on Facebook. Scroll down to the bottom of the page and you should see a blue box detailing whether your account was hacked. Other writers here at Cult of Mac have gotten slightly different messages when they check the page, but so far none of us have definitely been hacked. Hackers were able to get their hands on “access tokens” in Facebook which allowed them to access compromised users’ accounts and scrape their data. On 14 million of the hacked accounts, attackers had access to name, contact details , gender, locale, relationship status, religion, hometown, self-reported current city, birthdate, device types used to access Facebook, education, work, the last 10 places they checked into or were tagged in, 15 most recent searches and more. “We’re cooperating with the FBI, which is actively investigating and asked us not to discuss who may be behind this attack,” wrote Facebook exec Guy Rosen in a blog post. Facebook says the attack didn’t impact Messenger, Messenger Kids, Instagram, WhatsApp, Oculus, Workplace, Pages, payments, third-party apps, or advertising or developer accounts.